SAGE India Digest: IS IT ENOUGH FOR A COUNTRY TO RUN ELECTIONS TO BE A DEMOCRACY? IS IT ENOUGH FOR A COUNTRY TO RUN ELECTIONS TO BE A DEMOCRACY? Citizens can assemble and are free to speak and exchange views, including the chance to organize a peaceful protest. The country has a free press so that newspapers, radio and TV, and digital media are free to report news and opinions. Citizens are free to have any religious beliefs they choose. Citizens are free to start businesses or choose the businesses they want to work in if jobs are available. Consider ‘every citizen can vote.’ In a real democracy, it would be one citizen, one vote. There would be no stuffing of ballot boxes with false names or the names of deceased people. There would be no one paying money on the side to voters if they voted for a certain candidate. There would be no threatening-looking persons hanging around polling booths who look like they would harm you if you didn’t vote in the right way. There would not be very short hours for casting a vote or voting centers that are far and difficult to reach. Consider ‘freedom of assembly.’ Can the government stop certain groups from assembling because they have radical ideas, or form gangs, or carry a lot of guns? Can the government put a limit on how many people can gather to protest a certain issue? Consider ‘freedom of the press.’ Are the press members sufficiently diverse in their opinions so that citizens hear a range of views? Is the press permitted to say bad things about the country’s president or his or her political party? How should the country handle press members who distort the truth or even lie in quoting their findings? One of today’s major issues is to protect the Internet’s ‘net neutrality.’ Internet service providers such as Big Cable and Big Telecom wanted to slow down websites they dislike or disagree with in the interests of giving faster access time to businesses over citizens. Fortunately, the FCC proposed new rules protecting net neutrality for years to come. Consider ‘freedom of religion.’ Are people relatively free to change their religious affiliation or even to decide to be an agnostic or atheist? Does any religious group have considerable power to influence legislation in their favor? Finally, consider ‘freedom to start a business or join a business.’ Are citizens free to move to other cities in search of the best job? Are they free to choose the work they want to do, including starting their own business if they can find the capital? Now, are you clear about what all a country needs to follow to be a REAL DEMOCRACY! 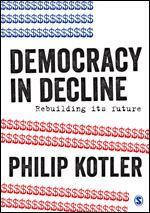 In his latest call to arms, Philip Kotler confronts the Democracy’s gloomy outlook positively with some potential solutions, as well as an invitation for you to get involved in the democratic issues that impact your life. Know more about the book here. You have raised such an important topic.These questions need to be answered before elections.Now people might have some awareness and would know about the democracy and their rights.